The start of Spring always makes me feel invigorated. Birds chirping as the sun comes up, trees unfolding their leaves, and the fragrant bouquets of Spring flowers blooming…and my favorite way to embrace all of its beauty is to spend my weekends camping in the great outdoors. Luckily, Georgia is a great place to be if you’re an outdoor enthusiast like me. Even if you only stay overnight, getting out in nature and away from the hustle and bustle of the city is ALWAYS good for the soul. Here are a few spots I recommend. Vogel is located at the base of Blood Mountain in the Chattahoochee National Forest. If you’re driving from the south, you will pass through Neel Gap, a gorgeous mountain pass near Brasstown Bald, which is the highest point in Georgia. Vogel is perfect during the fall when the Blue Ridge Mountains leaves are the most vibrant in colors. 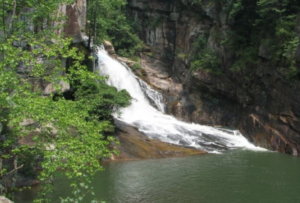 There are a variety of trails to choose from, including the popular 4-mile Bear Hair Gap loop, an easy lake loop that leads to Trahlyta Falls, and the challenging 13-mile Coosa Backcountry Trail. Cottages, campsites and primitive backpacking sites provide a range of overnight accommodations. Stone Mountain has many things to offer, but did you know it’s one of the most popular campgrounds in Georgia? The campground has a variety of options to choose from including RV/motor home sites, yurt rentals, tent sites, RV rental sites and safari tent rentals! The park not only has a wide variety of amenities but also offers several packages such as camping and golf, Holiday weekend stays, Adventure passes and more. If you’re looking for a great place to take the whole family, Stone Mountain is your best bet! At two miles long and nearly 1,000 feet deep. Tallulah Gorge is one of the most spectacular canyons in the Eastern U.S. Run, climb, bike or hike Tallulah Gorge State Park, exploring beautiful waterfalls, steep-sided canyons, and gorgeous river banks near Tallulah Falls, Georgia. If you’re a history buff, the Park’s Jane Hurt Yarn Interpretive center highlights the history of this Victorian resort town along with a movie that features footage of rock climbers and kayakers on their journey through the rugged terrain of the gorge. Accommodations include tent, trailer and RV campsites. If you’re wanting to explore the outdoors but you’re not ready to make the leap into the full campground experience, The Martyn House Farm is a glamper’s paradise. Located in the North Georgia mountains in Ellijay, guests stay in one of our 4 luxury sleeping tents from India, open April 15th -November 15th, The Studio, which is open year round, or rooms in their 1930 farmhouse which are open for winter getaways. The Martyn House is great for taking a stroll on TMH Trail, hanging out at the pond, crocket, bocci, or relaxing by the fire pit for conversation and fun. It should be noted that this is an adult only facility, so it’s the place to go if you need a weekend away with just your significant other or girls weekend retreats. And remember, Spring is also the perfect time to buy or sell a home. If you’ve been thinking about starting your home search or listing your home to sell, we have specialists on our team that only focus on one thing – your needs! Be sure to call The Peters Company!